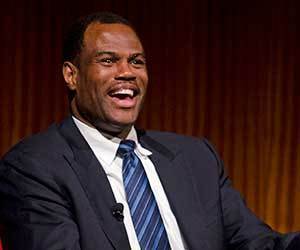 National Basketball Association (NBA) Hall of Famer David Robinson and his son, a College of Arts and Letters graduate and former football player Corey Robinson will be the featured keynote speakers during the University of Notre Dame’s Martin Luther King Celebration luncheon on Jan. 22 (Monday). This campus-wide luncheon will be the capstone event of Notre Dame’s 2018 Walk the Walk Week in honor of the legacy of Martin Luther King Jr.
Corey will interview his father in a fireside chat format, exploring the family’s motivations for service and sharing insights on how they have worked to serve their communities and make a difference. Corey graduated from Notre Dame in 2017 with a Program of Liberal Studies major and a sustainability minor. A former Fighting Irish football player, he stepped away from the game after three seasons due to concussions. He continued his involvement with the football program as a student assistant coach during the 2016 season and served as the student body president. 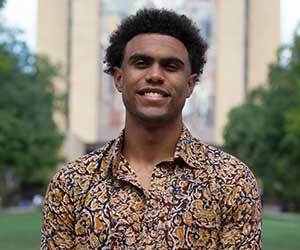 While at Notre Dame, Corey co-founded the nonprofit organization One Shirt One Body, which promotes the pursuit of higher education through the donation of issued gear by college athletes to their local communities. A Rhodes Scholar finalist, he was also a first team Academic All-American. He currently resides in New York and works at Gagosian Gallery, a leading contemporary art gallery. David graduated from the U.S. Naval Academy and was the top pick in the 1987 NBA draft, after completing his service to the country in the U.S. military. He went on to lead the San Antonio Spurs to a pair of championship titles, was a 10-time NBA All-Star, and a two-time Olympic gold medalist. David was named one of the 50 greatest players in NBA history. Long recognized for his commitment to community development and education, David founded both the David Robinson Foundation to support elementary schools in the San Antonio area, and The Carver Academy, an independent school designed to serve pre-K through eighth grade students. David was instrumental in launching the Admiral Center, a non-profit initiative formed in partnership with Living Cities to support professional athletes and entertainers with their philanthropic endeavors. He now serves as a founding member of Admiral Capital Group, which seeks to combine interest in private equity with a desire to make a positive social impact. Notre Dame’s Walk the Walk Week luncheon begins at 11:30 a.m. in Joyce Center’s north dome. The event is open to students, faculty and staff, and is a free but ticketed event. For more information, visit diversity.nd.edu.